Hungarian police have used tear gas and water cannon to quell violent overnight protests in Budapest in which buildings were attacked and cars set alight. The clashes happened following a rally demanding the resignation of PM Ferenc Gyurcsany, after it was revealed his government had lied during an election. 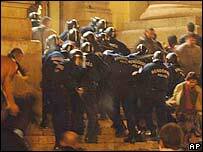 The worst fighting came when protesters stormed the state television building. Dozens of people were hurt, including many police officers. The city is now said to be calm. It was the first such unrest to take place in Hungary since the fall of communism and the establishment of democracy in the late 1980s. An emergency meeting of the national security cabinet was called for Tuesday morning. The main opposition party, the centre-right Fidesz, says it will boycott parliament. The BBC's Nick Thorpe, in central Budapest, says the trouble at the state television station began when a small group of protesters who had spent the day outside parliament tried to hand in a petition. 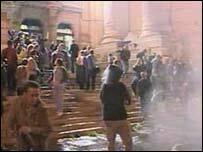 The police used tear gas and water cannon on a group of protesters who broke into the building. For a brief period the station went off the air. "Nothing like this has happened since 1956," one young protester told Reuters news agency, referring to Hungary's failed uprising against Soviet rule in October 1956. Officials told state news 150 people were injured in the violence, including 102 police officers. Our correspondent says the city is now mostly quiet, with only a handful of protesters left in the area. 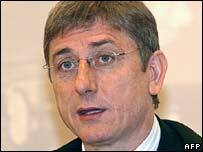 Earlier Mr Gyurcsany told the state news service he had no plans to resign. "The street is not a solution, but instead causes conflict and crisis," he said. "Our job is to resolve the conflict and prevent a crisis." He said those who had called for a "radical solution" to Hungary's problems were also partly to blame. Smaller protests were also held in other cities around Hungary. Mr Gyurcsany's comments, which sparked the violence, were heard in a tape of a meeting he had with his MPs a few weeks after April's election, and leaked to local media on Sunday. In excerpts broadcast on state radio, Mr Gyurcsany says harsh economic reforms are needed. "There is not much choice. There is not, because we screwed up. Not a little, a lot. No European country has done something as boneheaded as we have. "Evidently, we lied throughout the last year-and-a-half, two years... You cannot quote any significant government measure we can be proud of, other than at the end we managed to bring the government back from the brink. Nothing." In a speech sprinkled with obscenities, Mr Gyurcsany says: "We lied in the morning, we lied in the evening." The prime minister has received the backing of Socialist MPs who on Monday voted unanimously to support him. However, Hungary's President, Laszlo Solyom, said Mr Gyurcsany had created a "moral crisis", and opposition parties have called for his resignation. Matyas Oersi, an MP with the Free Democrat Party - the junior coalition partner in the government - told the BBC: "It's a surprise - though understandable - that the people are angry at a political leader who, for the first time, is telling the truth: that the whole political class was lying." Protests had already been planned this week over tough austerity measures imposed following the Socialists' victory in last April's election, which have seen the government's popularity plummet. The measures, imposed under pressure from Brussels, include higher taxes and benefit cuts, are aimed at reducing Hungary's large public deficit. But our correspondent says the leaked revelations were, for some of the protesters, the straw that broke the camel's back. Local elections are scheduled in two weeks' time. The Socialists and their liberal coalition allies are trailing Fidesz in the polls. Have Your Say: Are you affected by turmoil in Hungary?